"I always felt we had to be careful about leaving too many people in Iraq," Gen. Ray Odierno said. 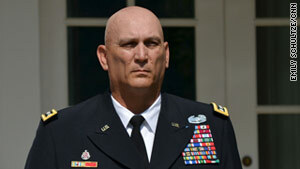 Washington (CNN) -- The new Army chief of staff, Gen. Ray Odierno, says there would be risks in leaving a large force of U.S. troops in Iraq beyond the present withdrawal deadline of the end of the year. Odierno, who has served as commander of multinational forces in Iraq, said a large American force could provoke new claims of U.S. occupation and distract from important efforts to develop the Iraqi military's abilities. "I always felt we had to be careful about leaving too many people in Iraq," Odierno said Thursday in a question-and-answer session with journalists at the Pentagon. He would not comment directly on reports that the Obama administration has decided on leaving 3,000 to 5,000 troops, should Iraq make a formal request for them. "What I would say is there comes a time, and I've said it before, when it becomes counterproductive," he said. "So we've got to decide what that right number is." The general, who served more than four years in Iraq in a variety of roles, said the United States is leaving equipment in Iraq, and transition and training on that equipment, as well as other training for Iraqi troops, has not been completed. "We need to probably be there to assist them at certain levels for a while," Odierno said.